Revered by the ancients as a symbol of eternity, the scarab beetle is called upon by to offer one guidance and revelations that will illuminate their mind/body/spirit journey. Considered a holder of sacred, cosmic knowledge the scarab is the ideal tool for transformation for those seeking to take their meditation to deeper levels for astral travel or spirit guide communications. The Scarab Egyptian Amulet offers powerful shielding from EMFs, negative energies, and clears and balances the auric field, bringing one clarity and greater creativity in their endeavors. 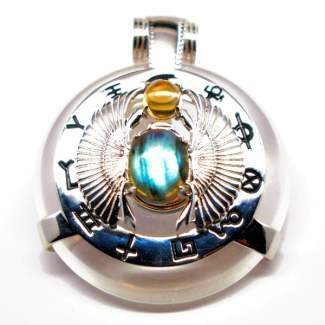 Our only line to feature 2 remarkable, authentic gemstones, this distinctive pendant boasts 11 powerful symbols to propel the manifestation powers of the scarab even further! The Lovers (Harvest tool): The energy of the Lovers infused with your Scarab pendant will task you to think carefully about the relationships in your life and if they’re serving your soul’s higher purpose. Observing the Lovers as the harvest tool in cipher, your Scarab pendant will assist you to make fruitful relationships that will open your eyes to your strengths (and weaknesses). Combined with the protective energy of the scarab beetle, the symbol of the Lovers repels negative individuals from entering your life. The Emperor (Window): Strong, diligent and proud, the Emperor is focused and in control of himself with the ability to manifest his desires. Ancient Egyptians revered the hardworking, persistent nature of the scarab beetle. The Emperor and the scarab beetle fuse together to encourage you to set goals and look at what is and is not working in your life in order for you to become the co-creator of your own reality. The Moon (Rotation): As a symbol for yin energy, nurturing and motherhood, the Moon reminds us to be in touch with the sacred feminine. Written as a cipher for a rotating wheel, the Moon and the scarab beetle’s energies work in synch to even out your masculine and feminine energies, which will vastly increase your creative potential and promotes a sense of inner balance. Strength (Serpent): The scarab beetle has been used as a symbol of protection for thousands of years due to its healing and energizing properties. Similarly, the Strength symbol contains protective energy that assists us in overcoming our fears and reigning in our desires. Your pendant will task you to accept the things you cannot control and protect you from harmful external influences. The Star (Fish Hook): Creating the life you’ve dreamed of requires courage, hope, and above all, a vision. Enter the Star, one of the Tarot’s most inspirational symbols, and one that helps us get in touch with our dreams. The Star amplifies your Scarab pendant’s high vibrations, and wearing your pendant while focusing on your true desires will allow you to re-connect with your dreams and have the confidence to pursue your own unique path. The Magician (Tent): The Magician has it all together: he’s the Tarot’s alchemist, symbolizing our ability to use our mind, body and spirit to attract everything we desire into our lives. In ancient Egypt, the scarab beetle was able to transmute the dirt of the earth into the foundations for a new world. Reflecting on the cipher of the tent, all of your dreams can come true as long as they have a logical, structural component. Meditating with your pendant will increase your self-confidence and draw in positive forces that will assist you in achieving your ambitions. The Chariot (Tent Wall): For being such a small insect, the scarab beetle had immense staying power and an incredible sense of purpose. The Chariot’s intense, driven nature is a perfect parallel for this revered Egyptian symbol. Even the most tiring days and draining issues will weigh less heavily on your soul when you tap into the immense reserves of energy within your Scarab pendant. The Hermit (Hand): The Hermit is a reminder that in order to fulfill our heart’s desires and find inner contentment, self-reflection and time spent alone are required for us to get in touch with the higher self. Like the Hermit, the scarab beetle represents the benefits of self-trust and solitude — the key to happiness and success lies within your own hands, not from external sources or outside approval. Using this pendant for intense, soul-searching meditation sessions will yield illuminating truths about your spiritual journey. The Hierophant (Tent peg): The Hierophant is represented as a tent peg on your pendant, which reflects this symbol’s stabilizing energies. Similarly, the scarab beetle was seen by the ancients as a powerful creator for its abilities to create order out of chaos, and even became associated with the god of the rising sun, Khepri; both were said to spawn their own creation. Meditating with your Scarab pendant will allow you to restructure your life and create definitive goals. Temperance (Tent prop): The key to success lies in perfect timing, and the energy of Temperance infused with your pendant tasks you to trust the Universe to assist you instead of controlling your surroundings. Represented as the cipher of a tent prop, this symbol reflects on the scarab beetle’s ability to intuitively roll out a perfect amount of matter for its heavenly creation. Wearing your Scarab pendant will allow you to expand on your intuitive abilities, inner faith and sense of timing.